Nancy is our newest member to our hygiene department. She started with our office in 2015. She has worked in the dental field since 1985. 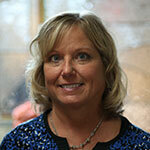 Nancy has worked in periodontics and general dentistry. She has an adult daughter and two grand sons. She also has a boyfriend Jim who showers her with flowers.